Staying organized every day is a difficult but necessary task. And, the first step in this long journey is to know what you want to do with your day. The next step is to write down everything that you want to achieve and prioritize them according to their urgency. Many people still rely on the traditional method of pen and paper, but smartphone apps have become a more common way to identify what needs to be done and when. 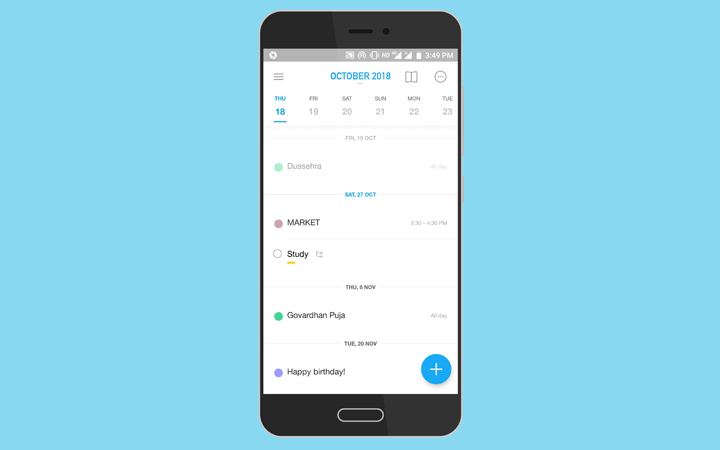 Now, there are a lot of apps that you can make use of to keep track of your tasks. If you don’t want to go through each and every one of them, then I recommend Any.do. Here’s how to use Any.do to make the most out of it. 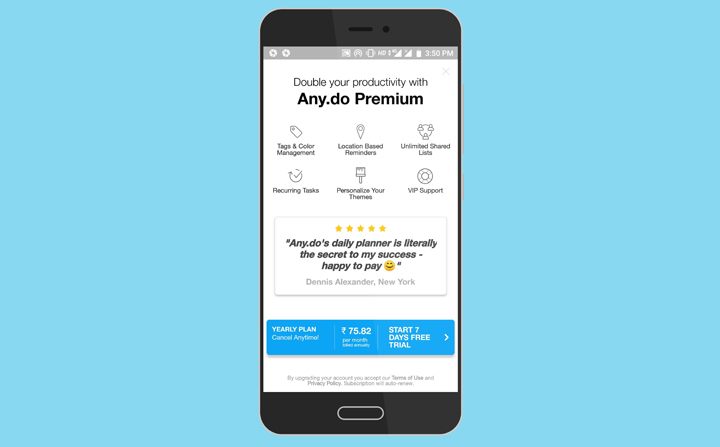 First, go ahead and install the Any.do app on your smartphone from the Google Play store. It’s free. Any.do works on the idea of lists i.e. you can create multiple lists for multiple aspects of your life. The app has a few pre-made lists like Today, Tomorrow, Upcoming, and Someday. The main page shows all the tasks from each list. The Today list is the default one i.e. whenever you create a new task without specifying the list, it will be added to the Today list. But you can change it in the Settings. Tap on the lists icon at the top left corner and you’ll be directed to the “My lists” section where you can create new lists and edit the existing lists. To create a new list, tap the “+” sign in one of the grids and name it. While lists are the gist of Any.do, tasks are what we want to use it for. And, creating a task in Any.do is extremely simple. 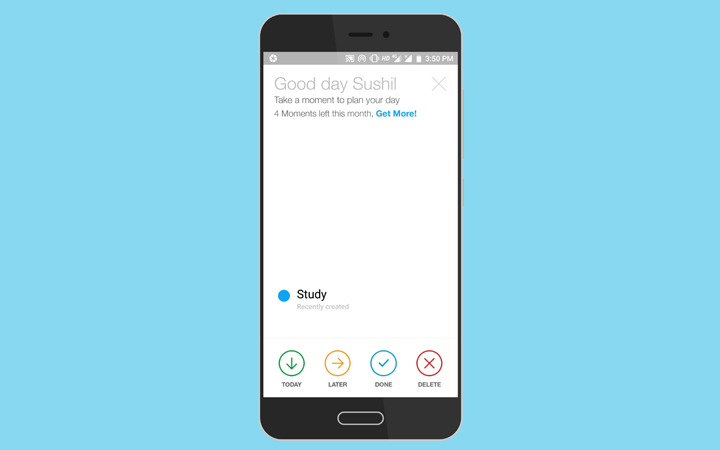 Tap the blue colored “+” sign at the bottom right and write down the task. As mentioned above, the task will be added to your default list. To add a task to a specific list, tap the “+” sign which is next to every list. While creating a task, you will get the option to select a starting action i.e. 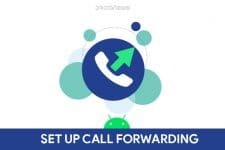 Call, Check, Get, Email, Schedule, Take, Send, Pay, etc. If that’s not your thing, you can simply type in your action. The app will show you suggestions as you type. Next, you can add tags to differentiate your tasks according to their priorities. These tags are color coded. Big tasks can be organized in a neat manner with the help of subtasks. A simple example could be the task of studying. While studying is the main task here, you can add different topics or subjects like English, Political science, Chemistry, etc. as subtasks along with some extra information related to each subject. And, for the main task, you can use the notes feature of Any.do to add helpful ideas related to it. And, if that’s not enough, then you also have the option to add attachments in the form of photos, videos, audio, and other different file formats. However, the free version is limited to a file size of 1.5 MB. 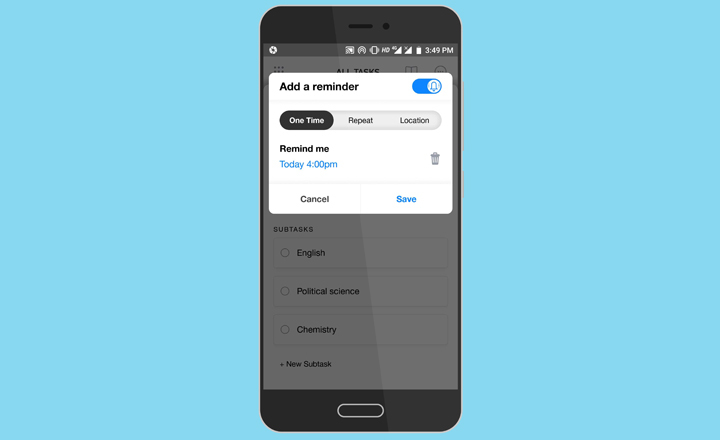 Any.do comes with extensive reminder support. You can set a one-time reminder for a later time on the same day, that evening, tomorrow, or next week. If it’s a long-term reminder, then you can also set a custom date and time. Another option here is to set a repetitive reminder i.e. you will receive a reminder for the same task every day or week at the same time. Next, is location-based reminders. But, it’s only available in the premium version. By connecting Any.do with your Google calendar, you can use it as an event creator which is automatically synced with the calendar. Here you can set reminders, location, and save notes related to the event. Moreover, you can also send invites from right within the app with the help of emails. Plus, the calendar view of Any.do looks much cleaner than that of Google calendar. A few extra little things include a clean user interface, cross-platform availability, browser extensions, along with the ability of printing and sharing lists. No matter how many lists you make, if you can’t stick to it, then there’s no point of making them in the first place. This is where the Moments feature of Any.do comes in the play. Basically, it is just a daily planner that pops up on your screen in the morning to remind you of your tasks and prioritize them. Each task comes with four actions – Today, Later, Done, and Delete. This helps in making sure that you focus on urgent tasks first and re-schedule less important tasks. And, all of it is done with just a few taps. 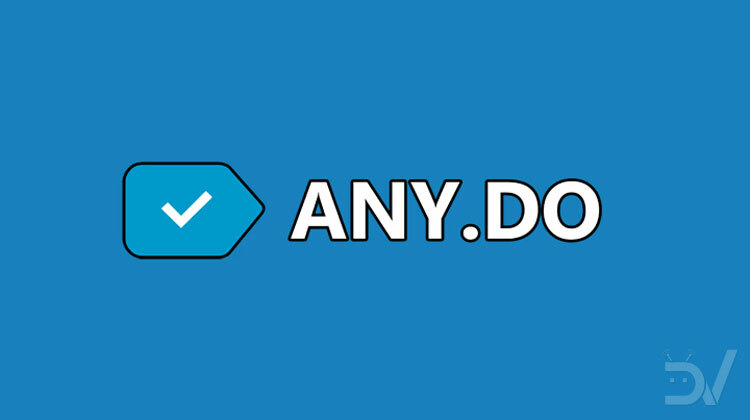 Any.do is free to install and use. But, it does have a subscription option that unlocks extra features. These features include extra tags and color management, location-based reminders, unlimited sharing, recurring tasks, more themes, and VIP support. I am using the free version and it has enough features that it works perfectly for me. I think it should be enough for most of the users too. So, that’s Any.do. 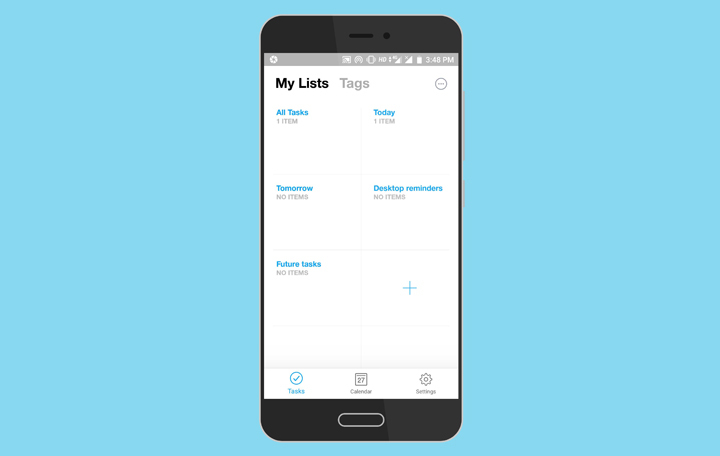 An awesome to-do app with a clean interface, a pleasant color scheme, and useful features. I have tried a lot of apps, and this one works the best for me. Keep in mind, though, that what’s best for me may not be the best for you. Still, if you are looking for a to-do app on the Google Play store, then Any.do is an excellent choice.